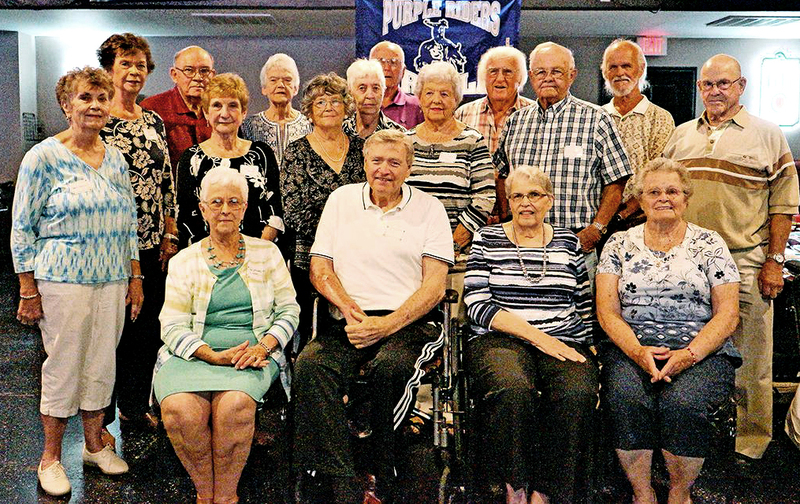 AHS CLASS OF 1955 held their annual reunion at Shae’s Pub and Grub in Arcola on Saturday, August 18, 2018. The class is a tight knit group which has made an impact on the community over the years. Many of the class members have chosen to stay and live in the area for their lifetimes. They have chosen careers, such as nurses, doctors, pharmacists, dentists, etc. Some classmates have been recognized as Distinguished Alumni by the Arcola Alumni Association. First row, (L-R): Ann (McCoskey) Livesay, Ted Shields, Phyllis (Cunningham) Kremnetz, Dorothy (Jacobs) Boyer. Second row: Janet (Koger) Stumeier, Nina (Goff) Bierk, Sharon (Cuppy) Spomer, Betty (Vickroy) Maier, Gale Hopkins, John Guyot. Third row: Gayle (Gilbert) Strader, Larry Bushu, Natalie (Keal) Smith, Shirley (Romine) Gibson, Bryon Little, Jim Reimer, Terry Clark. Not pictured: Pat (Shaffer) Sitz and Alice Rippey.